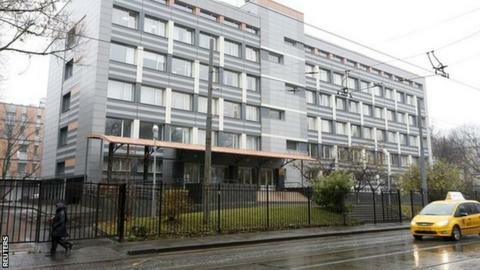 The Moscow Antidoping Centre has had its accreditation revoked by the World Anti-Doping Agency (Wada). The lab was suspended on 10 November amid allegations of doping, cover-ups, and extortion in Russian athletics. Wada said its decision, which the facility accepted and comes into force immediately, was because of "non-compliance" with world standards. In a separate move, Wada on Friday suspended the accreditation Lisbon antidoping laboratory. Wada did not disclose the reasons for the Portuguese facility's suspension. In Wada's independent commission report, published on 9 November, officials from the Moscow laboratory were accused of intentionally and maliciously destroying more than 1,400 samples after receiving written notification from the anti-doping organisation to preserve target samples. Since the Moscow lab was suspended on 10 November, it has been prohibited from carrying out any Wada-related anti-doping activities including all analyses of urine and blood samples. The revocation means the lab will continue to be prevented from carrying out the testing of doping control samples on behalf of Wada or any testing authority. With only four months to go before the Rio Olympics begin, Russia's athletics federation remains banned from international competition for its alleged involvement in doping. Governing body the IAAF imposed the sanction after Wada's report accused the country of "state-sponsored doping". Russia is hoping to persuade the sport's authorities it has done enough to tackle doping to have the ban lifted in time for the Games, which begin on 5 August. A decision is likely to be taken at an IAAF council meeting in May. Like the Moscow lab, the Lisbon anti-doping facility is also now prohibited from carrying out Wada-related anti-doping activities. The laboratory may appeal against the decision to the Court of Arbitration for Sport within 21 days of receipt of notice. News that Moscow's anti-doping lab has lost its Wada accreditation is no surprise given what we now know about its sideline in state-sponsored cheating but the postscript to this update, that Lisbon's lab has been suspended, is more of a shock. There are only 35 labs that Wada is willing to work with but it is down to 33 now with Moscow gone and Lisbon in limbo, and it could be 32 if Rio's expensive new unit fluffs its dress rehearsals before August's greatest show on earth. What with a muddle over meldonium, calls to extend the Russian investigation, a row over re-tests, confusion in Kenya, mysterious blood bags in Barcelona and a dodgy doctor on Harley Street, these are worrying times for the war against drugs cheats.